Forty years ago, a gallon of gas cost 63 cents, Rush just released their “Hemispheres” album, Grease was the number one movie at the box office, and Southeastern Tank opened its doors for the first time. A lot has changed over the last four decades. Gas costs nearly $3 a gallon, we carry mini computers in our pockets and the Internet has completely changed the way we live our lives. But through all of the economic ups and downs, political strife, and rapid development, Southeastern Tank is still here – still growing, still thriving, and still helping the municipalities and utilities they serve. Southeastern Tank was founded by Charles “Chuck” Dowdy and Frank Osborne in 1978. Operating at the time as Hermitage Harvestore, Chuck and Frank serviced the local farming community, building silos and feed systems for livestock, using A.O. Smith Harvestore products. Chuck and Frank understood the need that farmers had for quality silo systems. If farmers could save money on long-term maintenance and keep feed fresh and potent through the winter, it meant farmers could reinvest in other areas and grow their farm business. Hermitage Harvestore quickly built a reputation for quality, attention to detail and exceptional customer service. When Chuck and Frank said they would do something, they could be counted on to follow through, and their products spoke for themselves. For a while, business was booming but change turns on a dime, and in the 1980’s the farm crisis hit. American agriculture was plagued with its greatest economic crisis since The Great Depression. Across the country, farms were foreclosed and local communities were ravaged. This devastation quickly spread into industries that supported the agriculture market, which left Chuck and Frank with some tough decisions to make. Frank eventually chose to leave the company and strike out on a new career path while Chuck decided to weather the storm. During this economical shift, Chuck began reclaiming abandoned Harvestore tanks and sending them to farms in Eastern Canada, where the economy was in a less volatile state. This gave able-bodied Harvestore tanks new life on farms in the North and also allowed Chuck to fuel his new venture with the proceeds. Chuck was always looking for new opportunities to serve the local market. 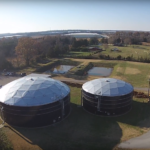 As fate would have it, the makers of Harvestore had a new product for rural water storage – Aquastore glass-fused-to-steel tanks. New on the scene, Aquastore tanks were proving to be far superior to traditional concrete and epoxy tanks on the market. The exceptional durability and technology of Harvestore silos carried over to the new Aquastore glass-fused-to-steel product that had caught Chuck’s eye. In addition to being durable, these tanks were virtually maintenance-free. They didn’t have to be painted, annual upkeep was minimal, and they were built to last for decades, not just a few years. 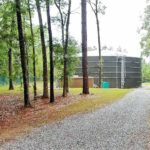 Aquastore tanks could save municipalities millions of dollars while also allowing them to expand affordably and serve more people, as populations began to grow. Chuck brought his trademark attention to quality and service to his Aquastore tank business, building his reputation one tank at a time. Southeastern Tank, as you know it today, was born. 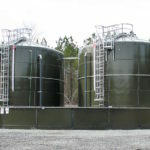 Southeastern Tank’s main focus was (and still is) providing viable liquid storage solutions for municipal potable water. However, in the late 1980’s and early 1990’s, a new opportunity presented itself when the EPA laid out strict regulations for landfills to help protect communities from toxic groundwater. Suddenly, every large waste company was required to build leachate tanks and secondary tanks to contain their wastewater. Chuck and Southeastern Tank were there to answer the call. 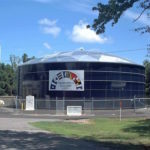 In 1992, Southeastern Tank built its first leachate tank. SET continues to serve the industrial wastewater and leachate community with over 120 installs to date. 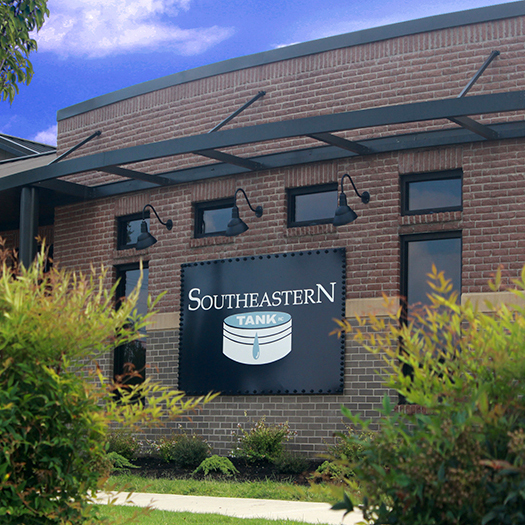 Southeastern Tank started as a small family-owned-and-operated business and, although the company has grown, SET still maintains that same family culture. In fact, several employees have been with the company since the 1980’s. Shelly Farmer, Southeastern Tank’s President/Director of Operations, came to work for Chuck Dowdy in 1989, all thanks to a wrong number. At the time, Chuck needed a receptionist so he called the local employment office to request help. Quickly after realizing he had dialed the wrong number, he found himself in a lengthy conversation with a woman on the other line claiming her daughter was the perfect fit for the job. That woman was Shelly’s mother and the rest is history. Since then, Shelly has worn many hats with SET, has learned the business inside and out and has become both a leader and the backbone of the company. Shelly isn’t the only employee who has been with SET for the long haul. Roger Schmelzer started with the company in 1980. He has been building tanks longer than many in the industry have been alive and he still pours concrete every week, is still hands-on with projects, and still keeps everyone at SET in check. Sadly, in 2000, Chuck left Southeastern Tank on medical leave and never returned to work. That same year, his son Dustin had come home from North Carolina to work for his dad. He wondered how the company would survive without Chuck at the helm. Dustin was left with awfully big shoes to fill. But Dustin had watched his father his whole life. He knew his father’s success was based on building trusted relationships, providing exceptional customer service, and good old-fashioned hard work. One additional skillset Dustin was able to bring to the table was a keen eye for marketing and sustainable business growth. He knew that customers would no longer come to them but rather he’d have to go to them. At just 30 years old, he started showing up at every trade show and industry meeting that would let him in. He talked to engineers and planners about the issues they were facing and offered solutions to their problems. He explained that although Aquastore tanks were superior in many facets, they weren’t always the best tank for every application. He gave people real advice and put the needs of the customer first. Over time, Southeastern Tank established itself as a brand and Dustin Dowdy became a recognized face within the industry, no longer just “Chuck’s son”. Times have certainly changed since 1978. 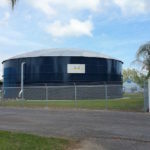 But Southeastern Tank has never wavered in its commitment to excellence and its promises to the municipalities, utilities, and industrial companies they serve. Since 2000, Dustin, Shelly and the entire Southeastern Tank team have been steadily growing the business, never losing sight of Chuck’s devotion to customer service and quality. The SET team is thankful for its customers and very proud to be part of a company that values doing the right thing. Looking forward to another 40 years of business…and beyond!